If you're thinking of coming to the Carole Nash MCN London Motorcycle Show this weekend there are only a few hours left to take advantage of the £17 advance ticket price. The offer ends at midnight tonight (Feb 14), after that you can still buy tickets on-line or on the gate for the standard price of £21. Don’t forget, kids under 15 get in free! 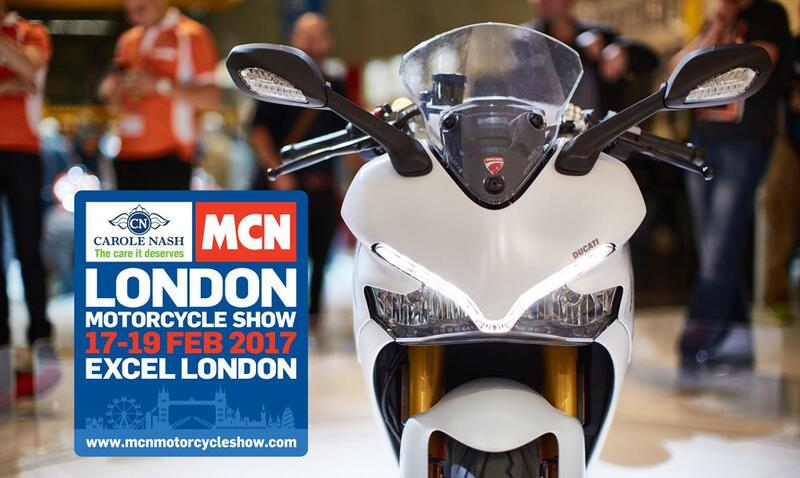 There is so much to see at the Carole Nash MCN London Motorcycle Show we've put together a list of the action so you don’t miss a thing. Go here for a full timetable of everything at the show. This is the celeb packed, live-action show that happens in the Michelin arena in the middle of the hall. John McGuinness' UK team of Neil Hodgson, Chris Walker and Aidan Collins take on Troy Corser's Australian team of BSB star Billy McConnell and Aussie speedway aces Mark Lemon and Kevin Doolan. Friday: 11am, 1pm and 3pm. Saturday: 10.30am, 12.45pm, 2.45pm and 4.45pm. Eight incredible race bikes will be fired up on the Sports and Performance stage each day including three GP Desmos, a RCW588 rotary Norton and a remarkable 1950's handbuilt Marsh MR4 four cylinder. British Friday: 12.00pm & 2.15pm. Italian Saturday: 10.30am, 11.30am and 1.45pm. Japanese Sunday: 10.00am and 12.45pm. Hosted by adventurer Nathan Millward the action on the Tom Tom adventure stage is non stop so whenever you arrive something fascinating will be happening. As well as hearing from seasoned travellers there will be presentations by kit and bike manufacturers. Britain’s only Dakar winner will be riding into the show at 3pm on Friday and interviewed on the Slide stage in the Michelin Arena. Sam will be at the show all day Saturday and interviewed just before each Slide show. Triumph have chosen the Londonshow to officially launch their stunning new Street Triple 765. Fresh from the press launch earlier this week this is the first time the bike has been revealed to the public.The launch takes place in the Michelin Slide arena. The Coy’s auction takes place at 2.30pm on Saturday. There are over 300 bikes up for sale with some incredible machines up for grabs so even if you’re not buying make sure you have a good look over the bikes. New bikes and old ones too! As well as all the timetabled action there are more bikes, more manufacturers and more stands at the show than ever before. With over 70 new models on display, the London Custom Bike Championships and Classic Bike of the Year competitions you’re in for a busy day! Silverstone MotoGP ticket offer - LAST CHANCE!